You have to go out of your way to visit Glacier National Park (406-888-7800, www.nps.gov/glac), and that’s a very good thing. Truth be told, the remoteness of this Crown of the Continent is one of its biggest draws. Sprinkle in a generous helping of gorgeous scenery and lots of wildlife viewing opportunities, and you have all the ingredients for a perfectly relaxing getaway. 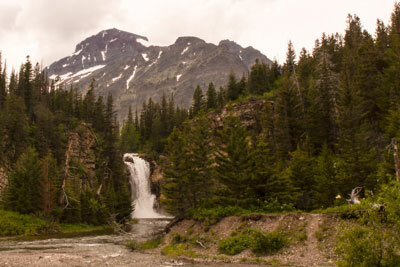 And although some areas of this pristine national park are pretty rugged, there are enough accessible trails, windshield views, drives and viewpoints to make Glacier National Park an extremely doable destination for wheelchair-users and slow walkers. 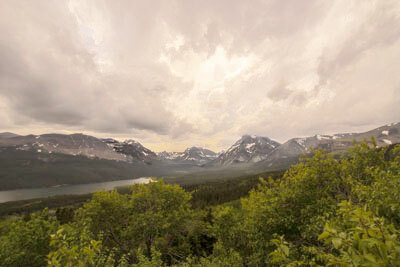 Glacier National Park is located in the northwest corner of Montana, along the Canadian border. 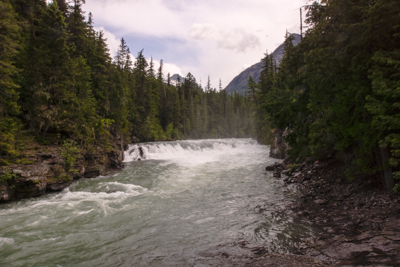 There are four entrances to the park — the west entrance, which is 30 miles from Whitefish; and the St. Mary, Two Medicine and Many Glaciers entrances, which are approximately 125 miles from Browning. 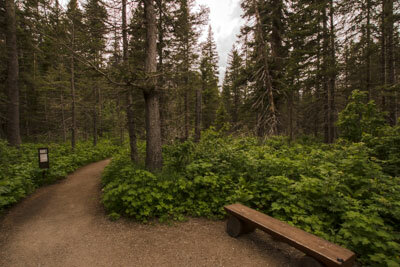 Although a good chunk of the park is not accessible by a paved road, the Going-to-the-Sun Road bisects the park and runs from the west entrance to the St. Mary entrance. This 50-mile span of roadway climbs to an elevation of over 6,600 feet, and offers some spectacular glacier views. The road is closed during the winter, but it opens in the late spring as the snow plows inch up the pass. Although it varies from year to year, the entire length of the road is usually open by late June. Two shuttle bus routes are also operated along Going-to-the-Sun Road. One runs from the Apgar Transit Center to Logan Pass and back, and the other runs round-trip from St. Mary to the summit. There are 16 stops along the length of the road, with a transfer point at Logan Pass. All shuttles include a lift or a ramp, and have wheelchair tie-downs. Private vehicles under 21 feet are allowed along Going-to-the-Sun Road, but sometimes parking is scarce, and taking the shuttle helps alleviate congestion. Not all of the shuttle bus stops are accessible, but the drivers announce which ones are not. Although it’s only 50 miles long, Going-to-the-Sun Road takes two hours to drive, mainly because of the curves and the climb. That said, make plans for a full day excursion, as there are many scenic viewpoints and overlooks along the way. After the road leaves Apgar, it meanders along the shore of Lake McDonald. At the end of the Lake, there’s a place to pull over near McDonald Falls. There is a curb-cut up to the sidewalk, where you can get a good view of the falls. The dirt trail on the left that goes down to the bridge is not accessible, but it’s still worth a quick stop here to see the falls. The road then begins to narrow as it approaches The Loop — a sharp hairpin turn — and opens up as it passes the Weeping Wall on the left. This series of waterfalls originates from exposed springs near the top of the wall, and runs for about 100 feet, along the length of the road. The summit is located just up the road at Logan Pass. There is accessible parking near the restroom, with a barrier-free path to the Logan Pass Visitor Center. The accessible path to the Visitor Center is located on the far right. Inside the lower building you’ll find interpretive exhibits and a ranger on duty to answer questions. Continue along the trail to the upper building for a different perspective of the surrounding glacier. And don’t miss the view from the parking lot. As the Going-to-the-Sun Road continues, it offers good windshield views of the retreating Jackson Glacier, before it passes the Rising Sun Picnic Area. There is accessible parking near the picnic area, but the picnic tables are located in the middle of a grassy area. Still if you can manage the grass, it’s a nice place for a quiet picnic lunch. Accessible pit toilets are located near the parking area. Going-to-the-Sun Road ends at the St. Mary Visitor Center, where you’ll find interpretive exhibits about the Blackfeet, Salish, Pend d’Oreille and Kootenae Indians that once inhabited the area. There is plenty of accessible parking near the Visitor Center, with level access to the building, and lots of room to maneuver a wheelchair inside. If you’d like to get a little more active, the park also offers several accessible trails. The Apgar Bicycle Path is a good introductory trail. It begins behind the Apgar Visitor Center, near the west entrance to the park. This wide, level asphalt path winds through the forest, and out to McDonald Creek, before it loops back out to Main Street. From there, it’s a level roll back to the Visitor Center. 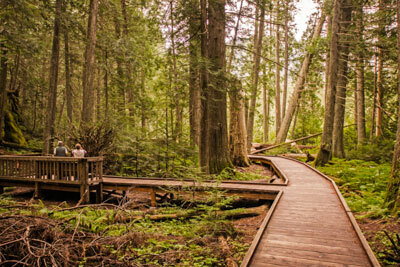 If you’d prefer a longer hike, the .7 mile-long Trail of the Cedars is a good choice. 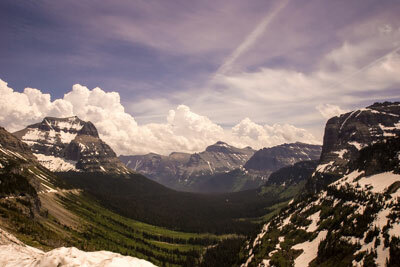 It’s located up the road from McDonald Falls on Going-to-the-Sun Road. Accessible parking is available at Avalanche, and this loop trail winds through the cedars, with plenty of places to stop along the way. The bulk of the trail is a wide level boardwalk, but there is a short section of asphalt in the middle. There are interpretive plaques and viewing platforms along the trail, and the boardwalk features low bumpers instead of high railings, for unobstructed views of the surrounding forest. An accessible restroom is located near the parking lot, and there is an accessible picnic area just a short walk from the trailhead. 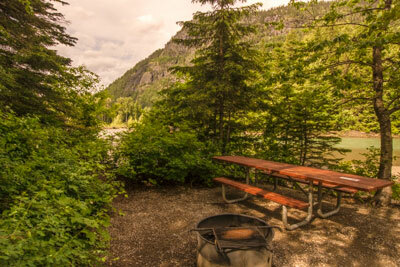 The picnic area, which features two tables and a grill, is located right alongside the river, and it makes for a very pleasant lunch break. A word of warning though, this is a very popular stop during peak season, so get there early in the day for the best shot at the accessible parking spaces. If you can’t manage that in your schedule, then it’s best to take the shuttle bus, which stops near the trailhead. Running Eagle Falls Nature Trail, which is located on the east side of the park, is the newest accessible trail. To get to the trailhead, take Highway 49 to Two Medicine Junction, then follow the spur for about five miles towards Two Medicine. Accessible parking and pit toilets are available at the trailhead. This hard-packed dirt trail travels for a third-of-a-mile to a rocky beach where you can get a good view of Running Eagle Falls. There’s also a bench there, so you can sit down and take it all in. The falls are located across the river, but the accessible part of the trail ends here. Still it’s a good vantage point. Last but not least, don’t miss the trail out to Goat Lick Overlook, which is located along the west border of the park, on Highway 2, about two-and-a-half miles east of the Walton Ranger Station. Accessible parking and pit toilets are available at the trailhead. From there, a short paved path leads out to an overlook along the Middle Fork of the Flathead River. Across the way, you’ll spot mountain goats, elk and deer that come to lick the mineral laden cliffs. Don’t forget your binoculars, and try to come early in the day when the animals are more active. Plan to spend at least three nights in the area, so you can explore the park at a leisurely pace. Whitefish, which is a 40-minute drive from the west park entrance, makes a good home base. Not only does it boast a nice range of accessible lodging options, but it also includes a variety of restaurants, bars and shops. 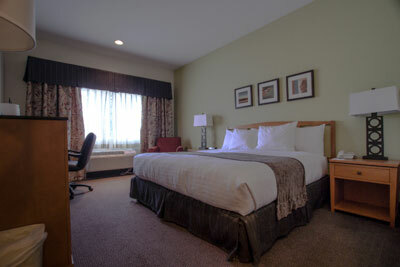 Best Western Rocky Mountain Lodge (406-862-2569, www.bestwestern.com) is a good budget lodging choice. Accessible parking is available in front, with barrier-free access to the lobby, and plenty of room to maneuver a wheelchair inside. Room 111, which is located on the first floor, features wide doorways and good pathway access, and is furnished with a 27-inch high king-sized bed. It’s also equipped with a microwave, refrigerator, a desk and two chairs. A wide pocket door leads into the bathroom, which includes a roll-in shower with a fold-down shower seat, grab bars and a hand-held showerhead. The shower is only 36-inches wide, however because of its placement you can transfer directly to the fold-down shower seat. 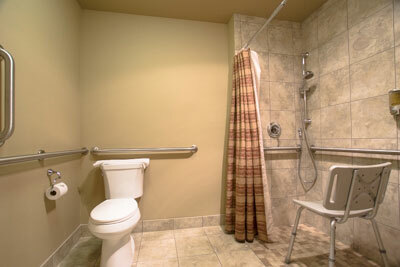 Toilet grab bars are located on the back and left walls (as seated), and the bathroom also has a roll-under sink. A full hot breakfast is included with the room rate. There is also good access to the public areas, including the breakfast room, which is located just off the lobby. If you’d prefer a more upscale experience, then check out Grouse Mountain Lodge (406-892-2525, www.grousemountainlodge.com). 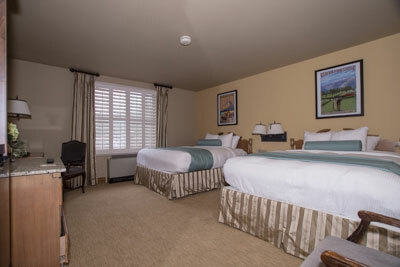 Located along the Whitefish Lake Golf Course, this 143-room property boasts good access and a very accommodating staff. There is accessible parking near the front door, with ramp access up to the lobby. Room 103, which is located on the first floor, features wide doorways, a lowered peephole, and good pathway access. There’s even a lowered clothing rod in the closet. It’s furnished with two 30-inch high beds with an access aisle between them, a refrigerator, a desk and a side chair. 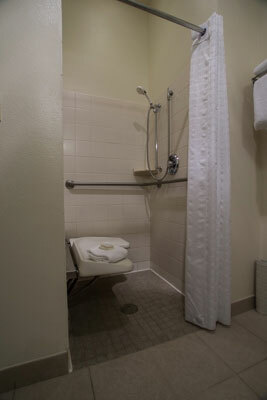 The spacious bathroom has a full five-foot turning radius, and is outfitted with a roomy roll-in shower with grab bars and a hand-held showerhead. A portable shower chair is also available. Other access features include a roll-under sink, and a lowered towel rack. 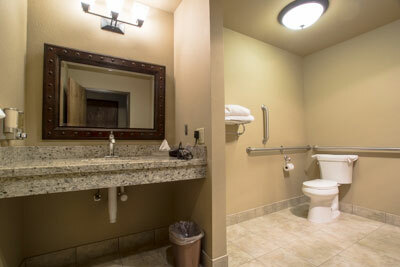 The toilet grab bars are located on the right and back walls (as seated). 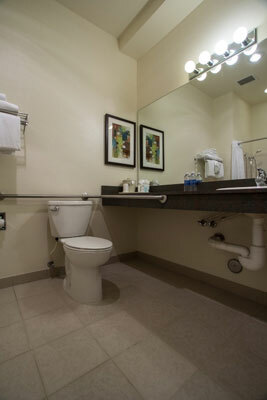 Round it out with a lowered mirror, and you have a nicely accessible bathroom. Access is good throughout the public areas of the lodge too, including Logan’s Grill, which is located near the lobby. The restaurant serves up some creative appetizers, along with prime cuts of meat, and a number of seafood options. For a real treat, try the wild sockeye salmon baked on a cedar plank. Even if you don’t stay at the lodge, at least treat yourself to dinner there, as it’s the perfect finale to a Glacier National Park adventure.